Recorded at Johnny Yuma Recording, Burbank; Saturn Sound, Sherman Oaks, CA; Ocean Way Recording, Los Angeles; Paisley Park Studios, Chanhassen, MN. Mixed at Smoke Tree Studios, Chatsworth, CA. Back insert: Made in U.S.A.
Track 1: © 1988 Webo Girl Publishing, Inc. Adm. by WB Music Corp.
Track 4: © 1988 Webo Girl Publishing, Inc. Adm. by WB Music Corp.
Track 5: © 1988 Webo Girl Publishing, Inc. Adm. by WB Music Corp.
Track 6: © 1988 Webo Girl Publishing, Inc. Adm. by WB Music Corp.
Track 7: © 1988 Webo Girl Publishing, Inc. Adm. by WB Music Corp.
Track 8: © 1988 Webo Girl Publishing, Inc. Adm. by WB Music Corp.
Track 10: © 1988 Webo Girl Publishing, Inc. Adm. by WB Music Corp. 1.) Like a prayer- You have got to admit that the song is catchy and has a great use of SYNTH! but she tends to have calmer tone to her if you compare it with into the groove but it has a small amount of repetition with lyrics. 2.) cherish- this is another catchy song that was a bit upbeat and has a bit of country feeling to it and her vocals are strong but it has a really catchy tune to it. 3.) express yourself- another madonna hit the feeling is a bit mellow in this song but like most of her songs it is catchy and a hit in its own way. 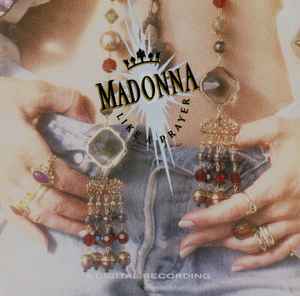 While not the only ace album of hers, "Like a Prayer" is Madonna's true magnum opus of an album. A personal diary of childhood dreams, spiritual quest, ambition and trauma transformed into a striking collection of songs as bitter as they're sweet on the surface, that haven't lost any of the gloss to the present day. At the time, mentioning Patrick Leonard and Stephen Bray may have set the album back in a way of sounding predictable (the two left a strong signature of theirs in her "True Blue" / "Who's That Girl? "-era stuff) but at the same time the dynamic duo brought the best in and out of Madonna, here every song and every detail in that song simply shining with artistic maturity and not just for plain commercial appeal - which there is, of course, plenty. One other moment of surprise here is Prince, whose presence in "Love Song" speaks volumes, turning something sentimental-by-title into a mechanically daring experiment (a tiny lyrical segment re-appeared years later in "Hung Up"), while orchestral brushes and minimal arrangements throughout the album reach for a slightly darker soundscape; the confusing guitar-thrashing intro of the title-song megahit (plus the even more confusing, spooky closer "Act Of Contrition"), the titillating synths along with the string arrangement that creeps up opening for "Oh Father" (one of her best ever songs), the soundscape moment (the radio sound switch at the tail end of another amazing song - the playful "Dear Jessie"). Then there is the sadness of "Promise To Try" that is really hard to shake off. "Cherish" (like "True Blue" previously) adds a nice catchy Motown vibe to it, standing out as the album's most cheerful (love) song, while "Keep It Together" cleverly uses the funky melody against a rather cynical comment on family values. "Express Yourself" with its words of personal encouragement remains somewhat questionable in the lyrics dept. suggesting material life isn't worth it, while at the same time Madonna of all embraced the material world concept with her arms open wide. Still, it's a pounding, muscular track (the album version that is - way way better than the omnipresent, spineless dancefloor-for-dancefloor's-sake remix that is featured in the video, audibly paving way to a later episode called "Vogue"). On first listen, "Spanish Eyes" may seem a bit cheesy but the prevailing melacholy and lyrics that address an AIDS-related death (AIDS served as a general leitmotif for this album, calling out for understanding and support of those infected with HIV), save it a great deal, especially from falling into the trap of becoming "La Isla Bonita pt. II". A personal favourite, and the album's jewel spot in the crown belongs to "Til Death Do Us Part". In so many ways, this is one weirdly amazing song, using a deceptively merry melody against a pretty grim story of domestic violence, told in first and third person. While many believe it is Madonna's personal story involving her former husband Sean Penn, Madonna herself never confirmed that to be entirely true. However, the song's narrative depicts frightening scenes of mental and physical abuse relevant to anyone's personal experience ("The bruises, they will fade away - you hit so hard with the things you say, still I wish you'd ask me not to go..."). A scary sing-along song that can actually open the eyes of many out there, living in fear and feeling captured by one such horrible life situation. So which issue is the one with the scented sleeve?